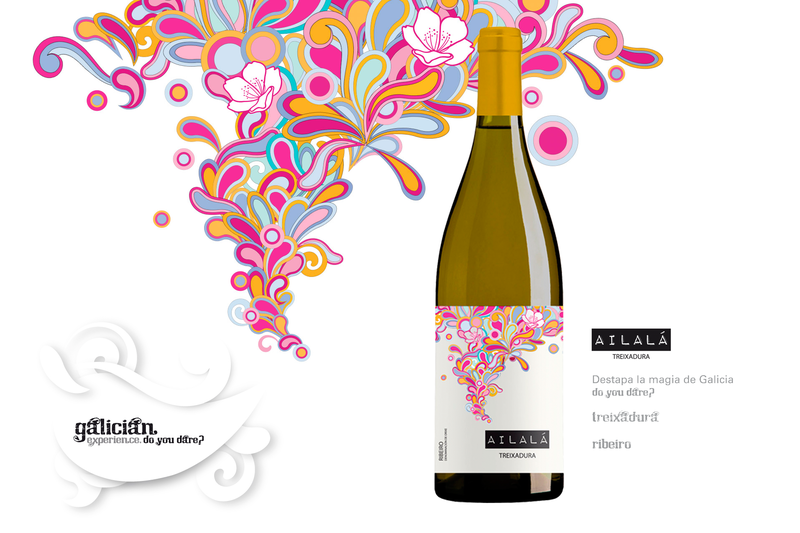 A wine that is fresh, lively and enjoyable. Each sip is a surprise. Do you dare? Made in the Galician region of Ribeiro. A Designation of Origin with centuries of history, tradition and experience that lends its name to one of the best and most famous white wines in Spain. Quite golden in color with wonderful reflections of light – very lively color. The aromatics on this wine are super clean and powerful with lemon curd, apricot, white flowers and seashells. Some wintergreen mint/fennel/cloves notes. Ripe melon and sweet lemon. Lots of body. Very dense, needs time. In the mouth notes of apricot, white peach, and peche de vigne. Just picked crunchy peach notes. Lots of zing, some tangerine, blood orange notes. Some lemon and grapefruit peel. Very persistent. Incredible relative value compared to other white wine of this ilk. The Treixadura is the noble variety of O Ribeiro. The base of every coupage. Its first reference in history dates back to the beginning of the 18th century, but its variability suggests that it was probably grown earlier. O Ribeiro is the ideal habitat for the Treixadura. The variety is fruit of a committed search for quality. As a variety that buds and ripens later than others, height above sea level is an important factor. Its nobility can be seen in its capacity for bringing out its best expression on dry, sunny slopes. The racemes are of medium to small size and contain tightly bunched, oval grapes which, as a whole, ripen into beautiful golden colours with violet highlights. The skin is thick and relatively hard (which gives it its name) and helps to reduce the damage caused by the rotting of the racemes (botrytis cinerea). As is to be expected of a high-quality variety, the wines combine sufficient alcohol volumes (12° to 13.5°) with notable levels of acidity. The most outstanding aspect of the Treixadura is its solid structure, fullness in the mouth and surprisingly subtle and delicate bouquet of elegant, complex notes of flowers and fruit. This harmonious balance between its solid structure and delicate bouquet explains why it plays an important role in any combination of varieties used in O Ribeiro to make wines that are to be laid down. The Ribeiro is the heart and soul of Spanish wines and, more than any other region on the Iberian Peninsula, it is home to the origin of winegrowing. The art of growing wine was brought to the Ribeiro region by the Benedictine and Cistercian monks on their pilgrimages to Compostela from France and Germany. Its commercialisation was a pioneering event. It was exported along the northern routes to Flanders and England as early as the 14th century. Christopher Columbus carried Ribeiro wine in his ship’s hold on his adventures. Ribeiro is a warm, inland region but its northern position and the typical Galician soil, made mainly of granite and not easily worked, in combination with other schist terrains (in Galician, xistos) or clayey soils make the terroir unique and very special. The colours of the countryside are transferred to the wines: whites, reds, aged in oak casks, sweet and toasted. Always made with local varieties and never with an excess of alcohol or wood. New technologies, the detailed specialisation of technicians and executives combined with age-old tradition add great value to our wines. Discovering Ribeiro is discovering a magical place and wines with soul.